Buffalo’s Wings and Things Bacolod? 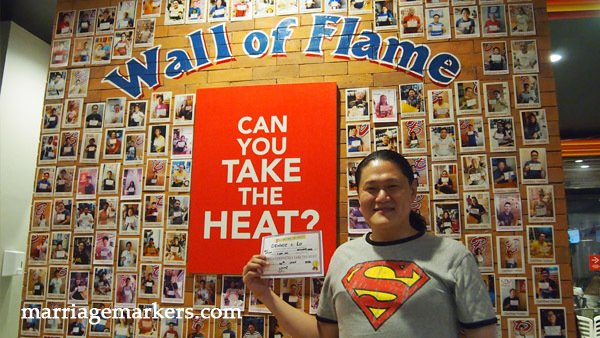 I earned my spot at the Wall of Flame at Buffalo’s Wings and Things Bacolod. 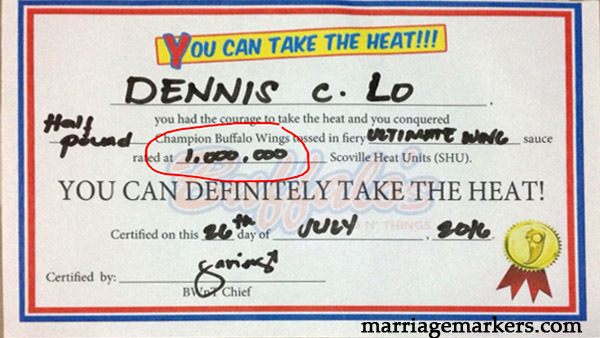 I really like spicy food and our friend Rey John Asparin of Fogo Grill Bacolod knows about it so he challenged me to take the Wingsanity Challenge at Buffalo’s Wings and Things Bacolod, owned by Justin and Jessa Chang. Not one to buck down on spicy food, I thought it was interesting. It was National Wing Day last July 26, 2016 at all the Buffalo’s Wings branches nationwide and so it was a good reason to try their food and also do the challenge. Upon ordering my Wingsanity, I was made to sign a waiver. I forgot what it said though. Everything actually went in a blur because we were with friends and it was a festive day, as many people dined there to take advantage of the half price offer for a pound of wings. 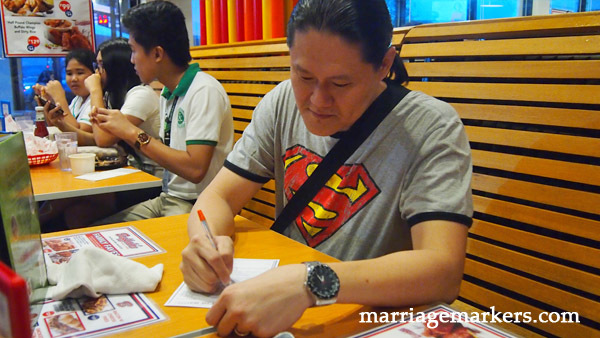 So when I ordered the Wingsanity, first, I was made to sign a waiver. You would think that it was just a gimmick, you know, to sign a waiver, but it is not actually. I got a half pound of Wingsanity, which is the hottest plate of chicken wings at Buffalo’s. It is a half pound of Champion Buffalo Wings tossed in their ultimate fiery wing sauce and is rated 1,000,000 Scoville Hot Units (SCU). I had with their signature dirty rice, which is also mildly spicy. For drinks, I had Moutain Dew and cold water. This is half a pound of Wingsanity. Looks like a small order but don’t let it fool you. 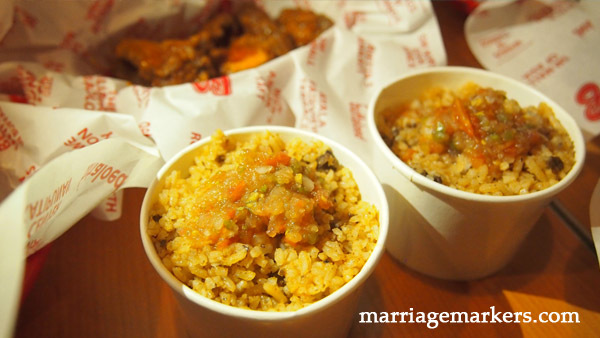 So I had my Wingsanity with one cup of dirty rice, which is the only rice available at Buffalo’s Wings. And so I braved it without prior preparation for my mouth as well as my tummy. Wifey kept documenting my meal. They then awarded me with this certificate and took my photo for their Wall of Flame. Pretty neat. 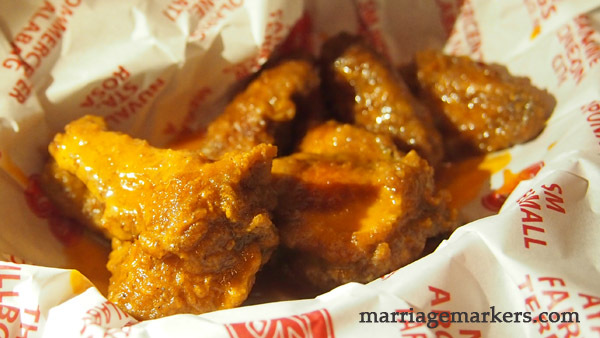 A half-pound order of Wingsanity is P149. 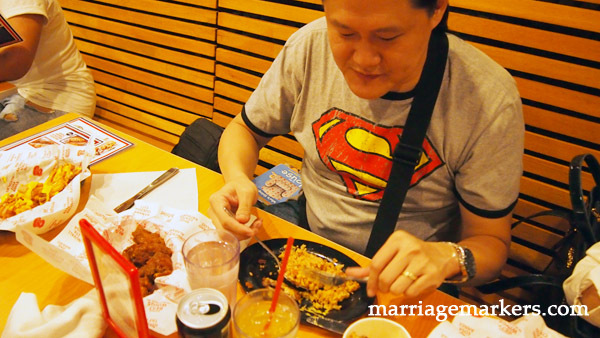 Yeah, just P149 for a smoking hot plate of Buffalo wings.